*While I'm in Europe - It's my last full day in Europe! I'm in Barcelona - I've lined up some fabulous guest posters. Please welcome Nereyda from Mostly Book Obsessed! I’m just another person that is obsessed with books. Seriously, liked obsessed! I’m 26 years old, I have WAY too many favorite books to name but some of my favorite authors include Richelle Mead, Rachel Gibson, Becca Fitzpatrick, Cassandra Claire, Chloe Neill, Jennifer L. Armentrout and Jana Oliver. My favorite colors are black and pink and I love anything sparkly. I LOVE using caps locks and exclamation points! I LOVE to read and listen to music and I am addicted to Amazon. I would LOVE to have a library like in Beauty and the Beast! When I first really got into reading 3-4 years ago, I HATED love triangles. Like with a passion! I always knew who I wanted the main character to end up with and I hated the other character. But, I’ve noticed that recently the love triangles are really starting to get to me. Some books have both love interest so damn good that I am completely torn up inside who I want the main character to end up with and will most likely change from chapter to chapter or book to book. The first book that really made me think about love triangles was Spirit Bound by Richelle Mead. Of course I wanted Rose to end up with Dimitri (duh! ), but each time Adrian showed up, he stole another little piece of me. I love the outcome of Last Sacrifice and I am excited to get to read more about Adrian in the new Bloodlines series. This is another one of those rare books where I still don’t know if I want Cassia to end up with Kyle or Xander. I really like Kyle but I think that the scenes between Cassia and Xander have more chemistry and definitely more angst. In The Body Finder I was totally, head over heels in love with Jay. He was just the sweetest guy ever and I was a little annoyed when Rafe showed up in book two and I wanted him to go away. But in the third book I felt so conflicted because I was really starting to like Rafe. Plus his chemistry and tension with Violet was intense. But at the same time, I was upset because Jay hardly came out in the third book. I’m still hoping for Jay and Violet though. Oh no, oh no! Jay forever, Rafe never! I'm hoping for lots more Jay in the fourth book. I really didn't get enough of a Jay fix in DOTD! Love triangles don't really work for me because I'm never torn. I always have a clear favourite. The only time I've really come close to being conflicted was in the Vampire Academy books. I'm also not usually torn about who I prefer in a love triangle - I always know who I think the best guy is. It wasn't even a problem in Vampire Academy, because I knew I wanted Dimitri for Rose and Adrian for me! 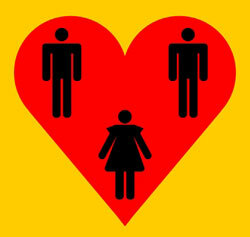 As much as I love love triangles, some times they get to be too much! No! I love Rafe, but I really want him to leave Jay and Violet alone! He can have his own romantic interest (*cough*me*cough*) in another book. I HATE love triangles. I hate them more and more as I read, and now I might not read a book if there is a love triangle that is a big part of the story. I actually like the even less when I don't have a clear favorite. That's just me though. I agree about Matched! Xander seems like the best choice, but Ky isn't bad, either. I'm no fan of love triangles myself. The love triangle in "Wither," the first in the Chemical Garden trilogy (haven't read the second ...) didn't bother me though, since it felt realistic. Being trapped with two guys doting on her? I can understand why Rhine ended up conflicted. I haven't read any of these series yet! But I'm a huge fan of love triangles... I'm probably one of the only ones out there, but seriously they are fantastic! Haha.